Jennifer Feltman has joined us as assistant professor of medieval art and architecture. She holds a PhD and MA in the history and criticism of art from Florida State University. Her research focuses on the complex ways in which works of medieval art, whether architecture, sculpture, or manuscripts, intersect with aspects of culture, such as intellectual history, religious practice, and political discourse. Feltman’s research has been published in the journals Studies in Iconography, AVISTA Forum Journal, and Athanor. She is also editor of and contributor to The North Transept of Reims Cathedral: Design, Construction, and Visual Programs (Routledge, 2016). Her book chapter, “Imagining the Sorrows of Death and the Pains of Hell in the Hours of Catherine of Cleves,” was just published in the anthology, Binding the Absent Body in Medieval and Early Modern Art: Abject, Virtual, and Alternate Bodies (Routledge, 2016). 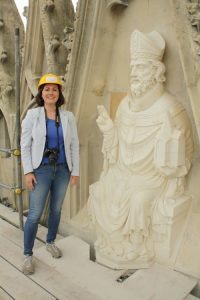 She is currently completing the manuscript for the book, Moral Theology and the Cathedral: Sculpted Portals of the Last Judgment in Thirteenth-Century France, which has received support from the National Endowment for the Humanities. Before joining UA, Feltman was Visiting Assistant Professor of Art History at the University of West Florida. She has also held teaching positions at Florida State University, The University of Florida, Young Harris College and Florida A&M University. The UA Department of Art and Art History provides an innovative, energetic and interdisciplinary learning environment that focuses on academic excellence in the areas of art history and studio art. We provide specialized education for majors and minors in our department, as well as offer general enrichment to students working within the broader context of a university-wide liberal arts curriculum. For more about our programs, visit our website: http://art.ua.edu/.